Most of us are aware of the “new” light emitting diode (LED) flat panels being advertised by companies like Sharp, LG, and Samsung. It doesn’t matter that they are really standard LCD displays being illuminated by LEDs instead of CCFLs. The message is new and exciting and everyone is taking notice. For those of us in the AV world, we know the real story is in the area of illumination of displays of all types, irrespective of cell structure. For the flat panel folks we are seeing a replacement of the CCFL backlights with edge or even full surface mounted LEDs. For the projector guys, they are beginning to replace conventional lamps with red, green, and blue LED modules. With its MicroTiles, Christie Digital has taken a unique approach in designing a cube system that breaks with conventional thinking. As we explore LED illumination application for displays, one area that gets little attention is projection cubes. The reason to bring this up is that they are the heart and soul of command and control and benefit most from the huge advances in LED illumination. Keep in mind that projection cubes are used for applications in 24/7/365 environments and the potential benefits of LED illumination adds a new dimension of affordability in this niche. So what we have here is a little evolution and a pinch of revolution to consider. First of all, let’s begin with the significant benefits that LED illumination brings to the party. Of course the first issue is life span. Where typical lamps will last 2K to 3K hours, LED modules will last from 50K to 80K hours depending upon who you believe. In total cost of ownership (TCO) alone, the LED illuminated cube can pay for itself over time. In terms of TCO and the environment, there is also the issue of lower power consumption, which is not insignificant when multiple cubes are in use. Speaking of the environment, LEDs do not use toxic material like the mercury in CCFL back lights. One area that is often overlooked is the fact that LEDs do not have UV ray emissions and this means that they do not degrade the optical coatings inside a display. From a “techy” point of view, we can now do a better job of controlling brightness uniformity since we can control each of the red, green, and blue LEDs separately. Last but not least, LEDs have a wider color space or gamut with which we can work. At least for my appetite, there is plenty here to get excited about. The heart of LED illumination is the module itself. While there are others working on their own LED illumination technologies, the folks at Luminus Devices are certainly the leaders with their PhlatLight modules. In speaking to one of the Luminus Devices engineers, he said, “PhlatLight LEDs are actually one of the most reliable light sources in the world today. PhlatLight LEDs have passed a rigorous suite of environmental and mechanical stress tests, including mechanical shock, vibration, temperature cycling and humidity, and have been fully qualified for mass production for use in even the most extreme high power and high current applications.” A conventional LED emits light into an epoxy-based capsule where the PhlatLight LEDs emit directly into air, resulting in significantly higher performance in displays as well as longer lifetimes. PhlatLight LEDs have very low failure rates and according to the engineer I spoke to, their median lifetimes stand alone as well above 100,000 hours under extreme, high-current operating conditions. So now that I have gained your interest, this begs the questions of who has embraced LED illumination for their cubes. The good news is that three major display companies have joined the mix with one of the three truly thinking outside (or perhaps inside) the box: Barco, Planar, and Christie Digital. Let stake a look at all three. Clarity from Planar Systems produces its LED illuminated cubes in 50-inch, 67-inch, and 70-inch screen sizes. Even though there are some design differences, the good folks at Barco and Planar have taken a similar overall design path while specifying 50K to 60K hours of LED life at a minimum. Planer Systems produces its LED illuminated cubes in 50-inch, 67-inch, and 70-inch screen sizes. In the 50-inch sizes they have both XGA and SXGA+ resolutions, while their 70-inch is a full 1080p. They offer a proprietary process that they call “Set It and Forget It.” Sounds a little like a TV infomercial but it works nonetheless. It acts as an automatic color brightness and uniformity controller. As with all cubes, the gap or mullion between the screens presents a challenge to make it as small and non-existent as possible. The Planar “Precision View Zero Mullion” is a very tiny .7mm is width and the Barco cubes are .8mm. 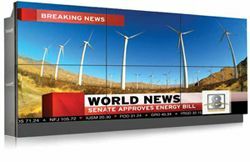 Barco offers 50-inch and 70-inch cubes in both the WXGA and 1080p resolutions. They have their own proprietary version of the color brightness and uniformity control. On its 70-inch full HD model they incorporate a 6X redundancy of key components, which is a great hedge against operational failure. They also employ liquid cooling harkening back to the “old” days of some CRT projectors. The one area of concern for both of these cube designs is light output. Their 70-inch cubes produce a light output of approximately 170 cd/m2 according to their spec sheets, and the brightest cubes are their 50-inch models at approximately 330 cd/m2. This will not be a concern in a lighting controlled environment, but in high ambient light, we need to see an improvement. This brings us to thinking outside (or inside) the box. With its Micro- Tiles, Christie Digital has taken a unique approach in designing a cube system that breaks with conventional thinking. How about putting a DLP chip with LED illumination in a small “box” that is 10 inches deep, measuring 12 inches by 16 inches, and weighing 20 pounds? Give it a mullion of 1mm between screens, which is smaller than any LCD video wall. These “boxes” can be stacked in nearly any configuration you can imagine and simply loop them together with a single cable creating the video wall. Did I mention 65K hours of life and a brilliant 800 cd/ m2 of brightness? I now have my adrenaline rush! There are a couple of other benefits to consider in these new generations of cubes. There is no burn-in or image retention of any sort. If the cubes use a DLP chip, they can have a closed optical system that is virtually dustfree. Last but not least, in some LCD panels, off axis viewing can be an issue that the cubes do not possess. Alan Brawn, CTS, ISF, ISF-C, DSCE, DSDE (Alan@BrawnConsulting.com) is a principal of Brawn Consulting, an audiovisual consulting, educational development, and market intelligence firm.